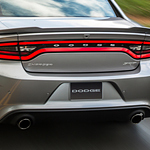 The Dodge Charger is a mid-size sedan, and it is filled with helpful technology that is designed to enhance your driving experience. The keyless enter system allows you to open the door simply by lifting its handle, so long as the key fob is on your person. This means no more fumbling for keys in your bag or pocket. To keep you safer while driving, use the Charger's 4C U-connect technology. This technology allows you to make hands-free calls with Bluetooth devices and to use controls that are mounted onto the steering wheel. The 4C U-connect technology also allows you to get navigational information with voice controls while you are driving. At C.H. Urness Chrysler Dodge Jeep Ram, we are ready to show you the technology in the Dodge Charger and get you behind the wheel for a test drive.